When Susy came to us, she was tired of working out, eating healthy and not noticing much change in her stubborn abdominal area. She had had 2 kids and her body didn't seem to want to get back to her pre-pregnancy shape. When she learned about SculpSure, she knew she wanted to try it. It took a while to build up the courage to actually book the appointment. It's one thing to look at yourself in the mirror and not like something, but it's another to reveal it to others! When I spoke to her after her treatments were completed, she told me that she felt comfortable with us from day one. Her apprehension melted away as soon as she began her consultation. That is important. You don't want to go somewhere and feel like a number - especially when you are literally and figuratively "naked"! When she came in for her second treatment, she wasn't sure if she noticed much difference. We reassured her that you do need two treatments and then you need to wait 12 weeks for the full results. The fat cells need to work their way through the lymphatic system and be excreted by means of our regular elimination processes. This takes some time - approx 12 weeks. At her last appointment, which was a quick follow up where we shot her final photos, she said she did notice a difference in how her clothes fit, and saw a difference in her flanks (love handles), but wasn't sure how much of a difference. Again, because the results are not instant, we forget how we looked and felt before. The body is changing slowly, so it's difficult to realize. When she saw her before and after pictures she was impressed. It did contour her belly (abs and flanks) nicely. She was extremely pleased. SculpSure is a great option for those who are at, or close to, their ideal weight. It's for those stubborn pockets of fat that just won't go with diet and exercise. It is not a get thin quick, magical device. It helps to destroy that top stubborn layer of fat. If you are frustrated with your body shape and you don't have much weight to lose, this could be your solution. Remember all of our consultations are free. Freeze It or Melt It? Check out this video from Auston-Weston Centre comparing the two technologies. Want more information? Contact us to schedule a free consultation. Does this fat burning thing REALLY work? We have had the SculpSure machine for almost 1 year now. In that year we have learned a lot and have witnessed some pretty awesome body changes in the clients that have experienced it. SculpSure has a beautiful way of literally sculpting a body. It remodels imperfections ie. lumps and creping (that drive us crazy), and reduces the amount of fat in the targeted area. It is designed for a person with problem areas that just won't go with diet and exercise alone. This includes areas such as love handles, belly fat, bra fat, saddlebags, upper thighs, upper arm fat, etc. (soon under the chin will be available too! ), that have that annoying layer of fat that just doesn't respond to anything else. Clients that fit that profile do very well. Those that have more fat to lose will still notice a difference - however they will likely need 3 or more treatments to achieve their goals and in some cases may be best suited for surgery. Is SculpSure right for YOU? The best way to find out is to start with a free consultation. We can discuss your expectations, medical history, and a treatment plan if you decide you would like to go ahead with treatment. Check out our own client before and after pics - we have updated the website and provided some new examples below. You can see that the results vary. In the clinical trials, they found that people lost between 15 - 33% of fat in the treated area. That's why we use the average of 24% permanent fat destruction. Still have questions? Nervous about the treatment? Are you wondering what it feels like? Check out this realistic article by Elise Minton Executive Beauty Editor of NewBeauty magazine. Call us 647-799-0400 with any questions and book a free consultation to learn more about the treatment and find out if you are a good candidate. I love when I am asked what I do for a living. Over the years our equipment and technologies have evolved, as has my answer to this question. I now feel like we change people's lives for a living - yes that sounds a little dramatic, but I do have 2 preteen daughters and maybe their drama is rubbing off on me (of course it's not the other way around)! Honestly though, we permanently remove unwanted hair - hair that makes people say no thank you to a pool party, no to a trip to the beach, and hair that dictates if they are able to wear their favourite outfit (Laser). That's big. We also help people get rid of unwanted broken capillaries on their face so they don't have to apply layers upon layers of make up to cover it up. We remove unwanted skin lesions like skin tags, moles, warts and other annoying growths. That changes how people see themselves. We remove sun spots and help even out skin tones (IPL). We help to increase collagen production with micro-needling combined with radio frequency (Intracel). We help get people using the right home care products - so their skin looks fantastic every day, not just after a treatment. Our amazingly talented Cosmetic nurse Naz helps turn back the clock almost immediately with Botox and Filler injections. And now we help change people's body image. By offering a permanent solution to fat reduction - SculpSure. We have only had the SculpSure machine for 7 months, however, we are now seeing people for their final photos and the results have been great! Have a look at our client Anna, who's problem was her bra fat area. If you slide the arrows all the way to the left you will see her before picture. Then slide to the right slowly and you will see her after picture. That was taken 8 weeks after her first treatment. She has since had her second treatment, we will keep you posted on her final results (12 weeks after her 2nd treatment). We have seen so many of our clients become more confident. That is why I love what I do, and why I think I can say that we change people's lives. Why did we choose Sculpsure technology for our clients at Freedom Medi-Spa? Simple, we feel it is the best technology available for non-invasive body contouring. For years, Coolsculpting has been the best choice for permanent fat destruction. Now there is a new better option - SculpSure. Here is a brief video from Dr. Travis Shaw on SculpSure vs Coolscupting . We are super excited to bring you the latest, most impressive body contouring technology. 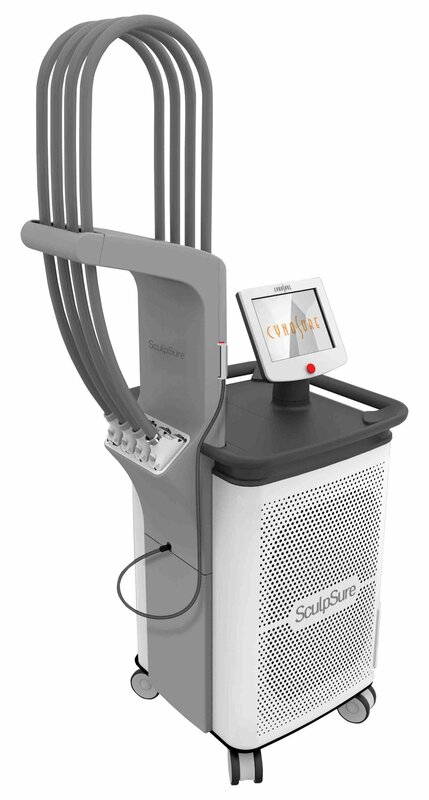 After much research over the past few years...we are thrilled to announce the arrival of our newest technology - SCULPSURE by Cynosure! Even with diet and exercise, most people have stubborn pockets of fat that seem impossible to lose. SculpSure is able to target and destroy these fat cells without affecting the skin's surface and without surgery or downtime. It uses light-based technology to permanently destroy up to 24% of treated fat in problem areas such as the abdomen and love handles. Over time, these damaged fat cells are naturally absorbed and removed from the body, with results seen as quickly as six weeks, and optimal results typically seen at 12 weeks. What areas does SculpSure treat? It is most commonly used on the abdomen and flank areas ("muffin top" & "love handles"). The number of fat cells stored in our bodies typically remain constant throughout adult life. After the SculpSure treatment, the destroyed fat cells will not return. Achieving a slimmer, more sculpted appearance is possible with the help of SculpSure. Call us at 647-799-0400 to schedule a consultation and learn more about your customized SculpSure treatment.